Low Flat Rates on All Bins! Get reliable and affordable waste management in the Cypress area of Houston. Our customer service team is ready to answer any questions you may have about a roll off rental. We pride ourselves on providing easy to understand pricing, and will always have your needs in mind. Call right now for an estimate on our cheap roll off rentals. Call us today so we can help determine which roll off is best for you. There are many uses for our dumpsters. Whether you have residential or commercial debris to remove, we have the perfect alternative for you. Our dumpsters come in 20, 30, and 40 cubic yard sizes. Our customer service team can offer helpful advice on your waste disposal project. The 20 yard roll off is standard for landscaping. You can easily transfer wood trimmings. The 20 yard can also be used for transferring dirt, rock and concrete in low quantities. Smaller than the 40 yard, the 30 yard is great for full home renovations. Its relatively large size allows the receptacle to hold household litter with ease. With 30 cubic yards of space, it is a standard choice for apartment remodels. Our 40 yard bin is the best choice for contractors working on blueprints. You can remove several tons of rubble with this bin. It is standard for apartment managers performing fumigation projects. Dumpsters are always delivered and picked up on time, I've never had any issues, I highly recommend this company. Our Blog Is For Your Benefit! The feedback of our customers matters greatly to our customer sales team. One customer wrote “No hidden fees, drop off and pickup was smooth”. Another customer wrote “Thank you very much. I will use again if I need it”. We are very thankful for your responses as well. If you have any opinions how we can better serve you, call and let us know. We are happy to take your comments. We Cater to Construction and Residential Clients! 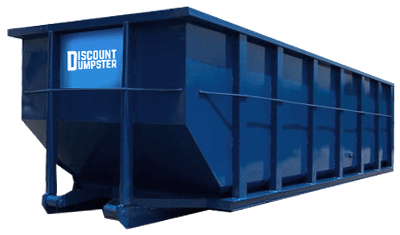 Discount Dumpster Offers A Variety of Sizes! Whether you are removing junk that has been hoarding in the attic or need to remove a lot tonnage from your demolition, the last thing you want is to spend time getting rid of it. This is where Discount Dumpster can help. Our dumpsters come in an assortment of options. Let us help you get out that garbage now! As a convenience to our customers, our containers are small in size but large in capability. Our 40 yard could be the best choice for removing up to 20,000 pounds of debris. Our 20 yard bin is often rented to remove heavy debris, and our loading doors make it easy to transfer heavy material. Don’t delay. Call now for the price of a dumpster rental! !